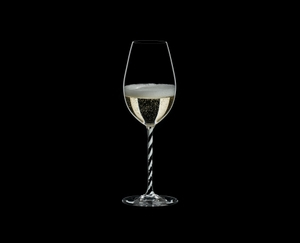 The exceptional handmade Champagne Wine glass of the eye-catching glass collection Fatto A Mano Black & White R.Q. stands out due to a black white twisted stem. This glass allows the wide range of Champagne to unfold. The larger rim diameter enables the aromas of Champagne to be released, in a way which is not achieved when using a narrow flute. The glass also includes a 'sparkling point' to aid the formation of the Champagne bubbles. Combining the sophistication of handmade glass in the style of the ancient Venetian tradition with the very latest glass making technology. All RIEDEL glasses are dishwasher safe. RQ = this item is supplied as 'Restaurant Quality' meaning that it may contain small imperfections when compared to the same item in 'best quality' and, as such, is offered at a special purchase price exclusively for use in restaurants.